There have been models and toys of trains for as long as there have been real railways. Indeed some early ‘models’ of locomotives were made first as sales promotional tools for the early railways, even if they later might have become playthings. 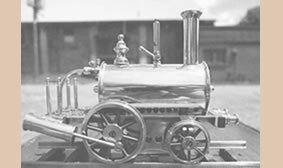 Among the earliest of all commercially produced metal toys dating from the second half of the 19th century are tinplate and cast iron trains. 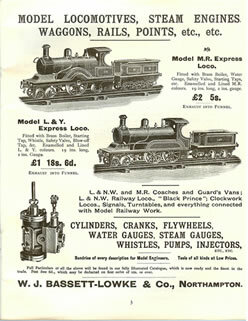 During the Victorian period toy and model trains and locomotives fell into a number of categories. There were the live steam engines, some expensive and usually only for the wealthy, but also cheaper ones often made in Birmingham hence the nickname “Birmingham Dribblers”. There were pull along trains in all shapes, sizes and materials, penny toys in lead and tin and latterly clockwork engines. The steam and clockwork engines might be intended to run on the floor, or a simple track assembled by the user, but there was no real sense of system about these trains. Most of these toys were made in Germany. Britain and France tended only to make the better class of steam engine. There was an indigenous US industry, with considerable use of cast iron rather than tinplate. The defining event in toy train history was the launch by Marklin in 1891 of the first complete system of trains. While the first models were derived from earlier products, what Marklin introduced was a series of standard track gauges, ready to use track sections for those gauges, and a range of locomotives, rolling stock and accessories to match. Now you could have an initial train set, but continually add and expand till your miniature railroad empire was complete – which it never was! This was of course good for the toy manufacturer, indeed this is possibly the first example of the expanding range, with items at various price points for Christmas, birthdays, parents and relations and pocket money sized, which is one of the basic features of most successful toys since. The first Marklin models were made in three gauges. Gauge 1 was 1¾” track gauge; gauge 2 was 2″ and soon became obsolete and gauge 3 was 2½”. Painted and soldered tinplate was the main material and clockwork provided the driving power. Marklin expanded and improved its range, after a few years adding a fourth small Gauge O 1 quarter; inch whilst the range of accessories was greatly expanded. Other German toy makers introduced competitive products, most importantly Bing (then probably Germany’s, and hence the world’s, largest toy maker) and also Carette. 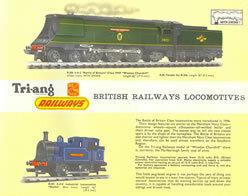 Despite the odd divergence these makers generally adopted the same standards as to gauge as Marklin, while developing new production techniques, in particular the use of lithographed (printed) tinplate. The lithographed technique facilitated the production of much cheaper and more colourful items, at the expense of some robustness. By the start of the 20th century other methods of propulsion were being applied. Live steam and electric powered models had taken to the model rails, although clockwork was still the prime mover. More importantly the first ranges of Marklin and Bing and others were growing and improving each year, and as with the rest of the German toy trade, was strongly export oriented and thus spreading toy trains world wide. The main markets were Britain, France (and their Empires) and the US. Britain at the time had no indigenous toy maker to compete with, nor really had France, but there was home based competition in America. Britain however had something else – model railways. The hobby of model railways can really be said to have been founded in the U.K. at the start of the Edwardian period. There were already active amateur model engineers building live steam locomotives whom shared a keen interest in the real railways. One of the embryo suppliers to this group was W J Bassett-Lowke of Northampton. Basset-Lowke saw the potential of using the German toy trains, particularly the track and mechanisms, with more accurate bodies to sell not as a toy to children but rather to adult enthusiasts. He used the services of Henry Greenly to desig his models. Greenly was something of a polymath and worked both in full size railways, models and miniatures. Among other things, he established a system of scales using the Marklin gauges as the starting point and he founded the first periodical devoted to model railways! Thus from the beginning the hobby of model railways was in part a toy and in part the effort of amateur and professional model makers co-existing, sometimes comfortably and sometimes not! Bassett-Lowke tended to use the services of Bing and Carrette for its own models, but of course once the idea of British outline models was established the German makers started to produce models for sale by other importers, for example Marklin made for the Gamages store in London. At the same time as Marklin was introducing the toy train to Europe America was experimenting with electrical novelties. One result was that several ranges of electric toy train were available from the later 1890s which in their size and use of home assembled two rail track rather resembled the pre-Marklin type of train. But they had a following, despite plenty of German imports. Also from 1900, Ives, an established US toy maker decided to compete with the likes of Bing with clockwork tinplate trains in gauges O and 1. As will happen, fusion occurred, in that Lionel, one of the ‘novelty’ makers, adopted European style tinplate tracks and some constructional approaches, but only offered electric trains. All of which kept the Germans innovative. All of this meant that during the Edwardian period and up to 1914 the toy train matured. Marklin and Bing still largely set the agenda, but they had to take some note as to what the English gentlemen and their US rivals were doing. The result was some beautiful toys, larger, more realistic and yet still quite toy like. Model Pacifics appeared, rather than improbable express 0-4-0s (though the latter dominated the cheaper sets). Live steam was available if required and electricity was becoming a more common form of propulsion, though in Europe clockwork was probably still No 1 even for top of the range items. All that was to change after 1914. Germany was largely unable to export to its main markets and so local toy train industries began to spring up or expand. In Europe this generally happened after the war, with, for example, the development of Hornby Trains by Frank Hornby of Meccano fame in Britain and JEP in France. Local production also got underway in Switzerland. In the US the curtailment of German – made toys allowed the existing local makers to dominate the domestic market, so Lionel, Ives and American Flyer could battle for the hearts and minds of American boyhood, and a little later Marx (Louis not Karl) provided toy trains for the proletariat. While the German makers did try to win back their old markets, anti German feeling and the advent of protectionism meant that they never really threatened the domestic producers in Britain, France or the US. However, the rest of Europe and the domestic market was open to them. In terms of product there were a number of trends. One was the advent of still smaller scales. OO and HO gauge grew from a collaboration between Bing and Basset-Lowke, designed by Henry Greenly, for a table top toy. These first models were really just toys and since the same tooling was used for UK, US and German outline trains the scale was a bit debatable. In fact as a toy the Bing Table Top system was not a runaway success, but what it triggered was a great deal of interest by adult modelers in this size of train. As a result two new scales emerged (HO 1/87 scale) and (OO 1/76) both in Britain using the same track gauge, although ultimately 00 gauge became the premier scale. During the 1930s, O Gauge that had been the leading scale, gradually lost ground to the smaller scales and in 1938, Hornby (owned by Meccano) launched Hornby Dublo ,a much more realistic set of electric (12 volt DC) and clockwork model trains than Trix Twin (14 volts AC), that had been launched into the British market by Bassett Lowke as the Table Top railway and with the ability to run two trains on one track. Hornby’s own O gauge models had gradually become more sophisticated but never really matched the quality of Bassett Lowke’s models. However even the cheaper Bassett Lowke models were generally too expensive for most people and Hornby catered for this market. During the 1920s and 1930s, model railways became a hobby and not just for the rich enthusiast. 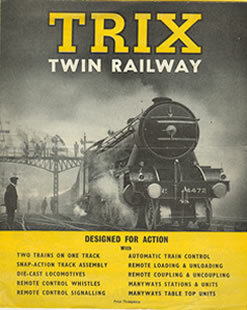 Magazines such as the Model Railway News and Model Railway Constructor placed an emphasis on home construction and better standards. There was also the growth of smaller manufacturers aimed squarely at this adult enthusiast rather than toy market. In the US in particular this led to the early adoption of standards suitable for modeling (the NMRA was founded in 1934). The toy makers took notice of these developments. While most toy trains were sold for children, they were sold to parents. And if Dad could be enticed to be a more active player, then perhaps more would be bought! Whatever the influence as the 30s went by the better toy trains became much more realistic, adopting shapes, colours and markings much more like the real thing. By 1938 in US, Germany and Britain there were second generation OO or HO scale systems from major toy makers that set new standards in realism. The advent of WW2 saw the model railway makers switching to war related production. Of the leading toy train players only the US avoided major physical damage during the war and its economy was in good shape too, so it not surprisingly got going with both toy and model train production much sooner than Europe. Perhaps as a reaction to war the US toy trains in some ways became more toy-like, with emphasis on extra features such as smoke or action cars. But at the same time model railroading blossomed, with the emphasis on HO scale trains which gradually took their place in the toy market as well. In Europe it took longer for the manufacturers to re-start production, and when they did the emphasis was on the OO in Britain and HO in the rest of Europe. 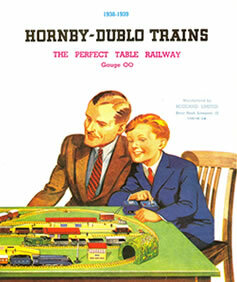 Although Hornby continued with its toy like O gauge trains, its major emphasis was on the Hornby Dublo range. Probably until the late 1950s Hornby Dublo was the leading and most realistic range of mass produced model trains in the UK. But Hornby made a fatal technical and marketing mistake by sticking with 3 rail track ie a middle rail for the electrical pickup. New players came into the market, with more realistic two rail track such as Fleischmann in Germany, Rivarossi in Italy and Rovex-Triang in Britain.These new ranges adopted 12v DC two-rail standards from the start. Hornby Dublo only introduced 2 rail at the end of the 1950s which was too late to compete effectively. Toy and model trains were a major market during the Fifties. They were produced in their thousands and tens of thousands. But throughout the world real railways were losing their pivotal role in transport to the car and plane, and so was the toy train in the imagination and desires of children. What is more the great post war ‘boom’ or ‘bulge’ of children were growing up, and the total market for toys was shrinking. So it was that the toy train market declined, some long established brands disappeared and others consolidated to survive. Sadly, the Sixties did not swing a lot for the toy train. Some enthusiasts prefer to use 3/8in to 1ft, which gives a more accurate scale/gauge ratio. Most models would have to be scratch-built, although there are some very impressive, but expensive, ready-to-run models available in Continental Europe. 32mm guage has become more popular due to the availability of a large range of quality locomotive and rolling stock kits. Technically the inside track width of 32mm is 3% under scale, it should be 32.958mm. The survivors in the model rail market adopted various strategies. But there were perhaps two main themes. The first was to acknowledge what had probably always been at least partly the case, that toy trains were in fact sold to adults. Some makers followed the scale modeler, producing ever more accurate and detailed models. Others looked more specifically at the adult collector. For as the toy train ceased to be a universal toy so groups of adults started to actively collect toy trains, not to be used as part of model railways but as objects in their own right. The second theme was to tackle the cost of production. In some cases it led to a cheapening of the product. But more generally it has led to new sources of production, such as Hong Kong, China or Eastern Europe. In Britain new manufacturers entered the fray in the 1970s such as Airfix, Mainline and Bachmann and despite various commercial ups and downs there is still a sizeable market here. There have been new gauges introduced (N and Z for the small scale, and G for the large) plus commercial revivals of the larger scales. In the US the larger scales have boomed, there is a strong market for toy trains to the old toy three-rail gauge O standards. Germany still supports two major makers of very superior ‘toys’, Fleischmann and LGB. So today the toy train is still very much with us and in a wider range than ever before. Apart from various scales and gauges, we have items clearly made for the adult enthusiast modeler, others for the collector, others thankfully still for children. Ironically the market has come full circle as Hornby has launched its “live steam” 00 gauge models of the Gresley A4 and Flying Scotsman, worthy successors to the Birmingham Dribbler!